The first row of clergy are seated, with two rows standing behind, in a studio setting, unknown location, c.1925. The black and white print is in excellent condition, affixed to an ecru and silver cardboard frame. Front row, from the left: Stefan Fedoronko, Emilian Krasicky, Atanasij Fylypiw (OSBM), Petro Oleksiw, Ambrose Redkevych, Mykola Bartman, and Omeljan Andruchowych. Second row, standing, from the left: Atanasij Kraykiwsky, Philip Ruh (OMI), Pavlo Suljatycky, Pavlo Reshetylo, John Kolcun, Petro Pasichnyk, Stefan Bachtalowsky (CSsR), and Nestor Drohomyrecky. 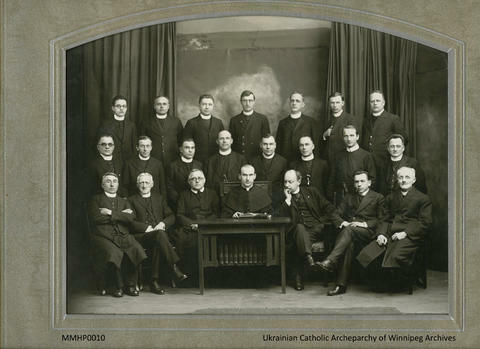 Third row, standing, from the left: John Holowka, Andrei Sasmatuk?, Mychajlo Gregorychuk, Michael Ircha, Michael Olenchuk, Michael Pelech, and Petro Kamenecky.